You know the saying, when life gives you lemons, well, when spring gives you herbs, it’s time to shake off the winter chill and do something fresh with them. I’ve been wanting to make traditional rolled biscuits for some time, and the sight of my herbs pushing up through the garden like this inspired me. I also recently splurged on a new mixer, convincing myself that my budding chef daughter needed my old mixer and that justified the splurge on a new one for me. And I was itching to try it out. While some people make doughs in a food processor, I’m confident in my mixer technique so stick with that. 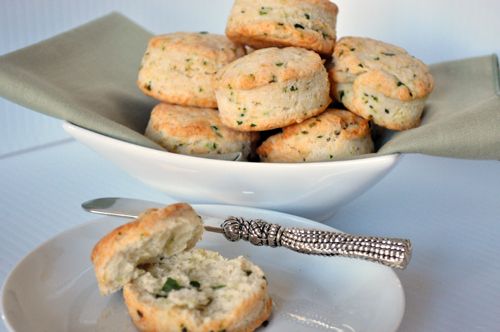 You can make these biscuits from start to hot out of the oven in about 30 minutes, so they are perfect for a weeknight dinner. The ingredient list is short and simple, and although I used the classic French herb combo of parsley, chives and tarragon, you really can use what you have. Dill would be delicious, but I didn’t have that growing in my garden this early in the season. 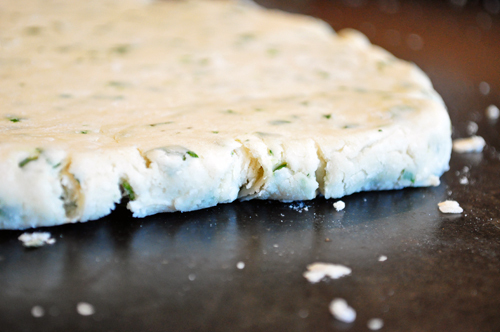 The process is similar to making my flaky tart crust dough, but you want to mix the herbs and cheese into the flour before you begin mixing in the butter. 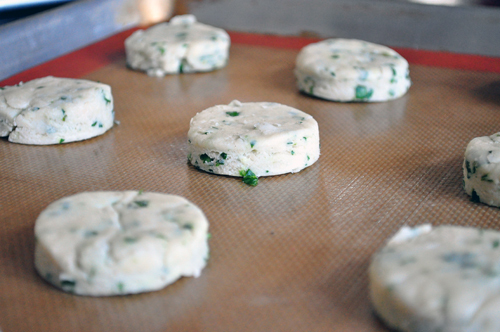 And don’t overmix – those small pea size pieces of butter that are left in your dough melt upon baking and release steam which is what creates the flaky layers of your herb biscuit. After the butter is cut in, add the half and half and mix just until it comes together barely. 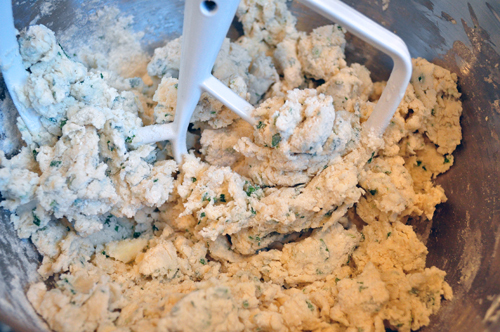 Remove the crumbly dough from the mixer and kneed it just a couple of times to get the dough to come together and pat it into a disk… …before rolling it out to about 1/2 inch thickness. 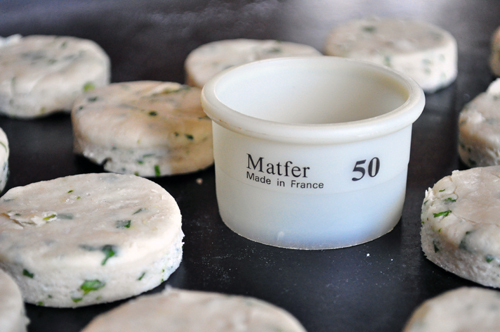 I have a set of these wonderful Matfer silicone cutters from France and I used a size 50 for these biscuits, which yields 24 nice small-ish biscuits. If you don’t have a biscuit or cookie cutter, use a small juice glass, but try to cut straight down instead of twisting to leave the edges clean so they rise and are flaky. As you’ve seen from most of my baking posts, I pretty much bake everything on silicone baking mats. 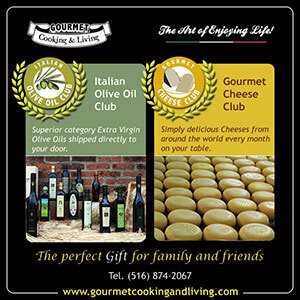 They’re well worth the investment because they produce great results and eliminate the need for parchment paper or foil lining. 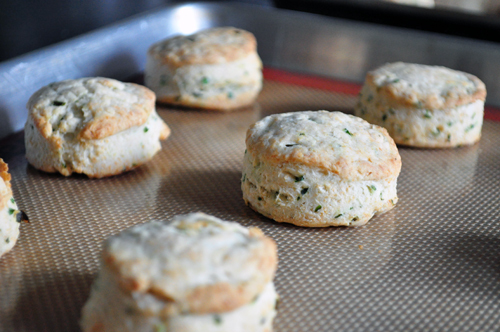 After just 12 minutes in the oven, the biscuits are browned and flaky. The aroma from the herbs and cheese was so inviting that despite my attempts to limit carbs, I ate three of these hot from the oven! I started to photograph them thinking I would set butter out to slather on. But they are so buttery already that you don’t really need to put anything on them to eat them. This recipe would also make a terrific topping for chicken pot pies, if you’re into them. Serve warm or freeze leftovers for another day! 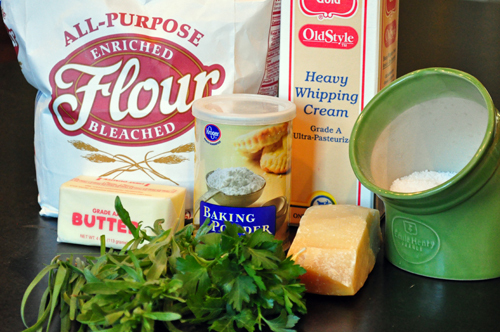 Combine flour, baking powder, salt, herbs and cheese in a mixer and mix on low until everything is evenly combined. Add butter and continue to mix on low until butter pieces are about the size of peas. Pour in milk with mixer running just until dough starts to come together. 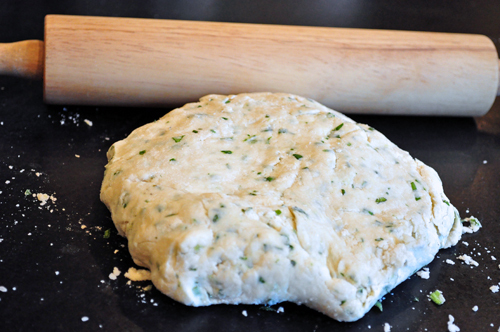 Remove dough and knead just once or twice to bring dough fully together, then quickly roll out to ½ inch thickness. Cut into 24 rounds using a size 50 round cutter. Bake on a silicone baking mat for about 12 minutes at 400 degrees. 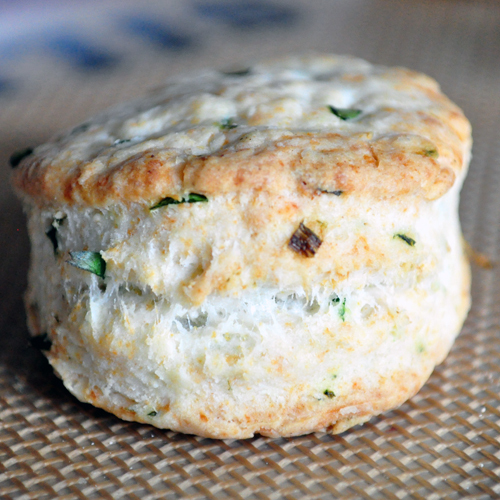 Biscuits should be light brown and cooked through, but not dried out. 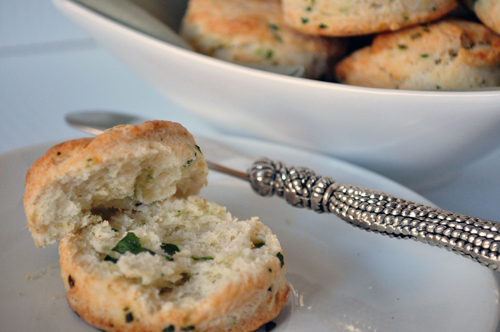 I’ve been craving biscuits quite a bit lately and this recipe looks wonderful! I’m planning to try it sometime in the next week. I can already smell it! Michele these are so lovely! 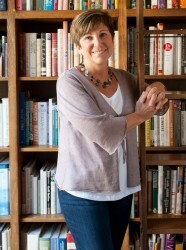 It has inspired me to look into purchasing some fresh herbs to plant! The biscuits look wonderful. 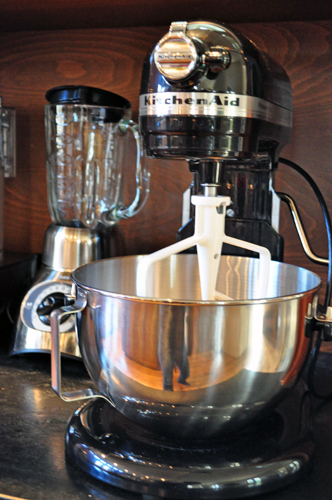 And I’ve never seen the silicone biscuit cutters before – I’m intrigued! 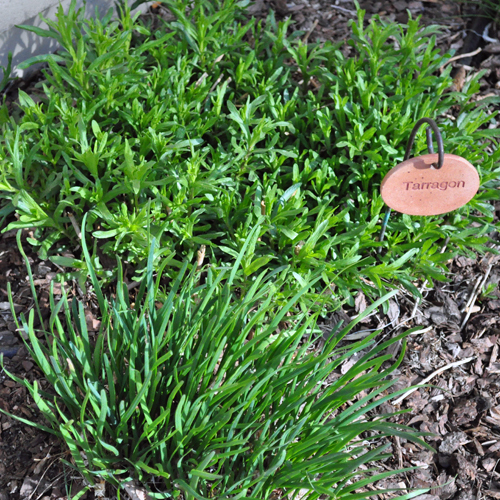 I love how you use fresh herbs…often we get too stuck in the rut of just shaking something from the spice rack. I think we miss out on a lot of the flavour when we choose dried over fresh! 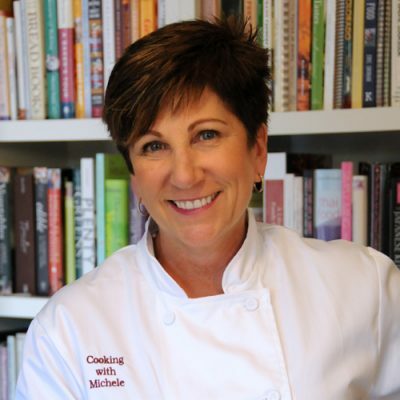 Charissa, I’m a firm believer of dried for spices, but fresh for herbs – SO MUCH better taste! I love biscuits. I have never seen silicone cutter before. Thanks for sharing! I love biscuits or any kind of bread. You mentioned about topping the pot pie with this biscuit. Would you top the pot pie with uncooked biscuits and put it in the oven? Or do you top the pot pie with cooked biscuits just before serving? Thanks. Lala, I’d cover the top of the chicken pot pie with the crust and bake it. Let me know if you try it and how it turns out! 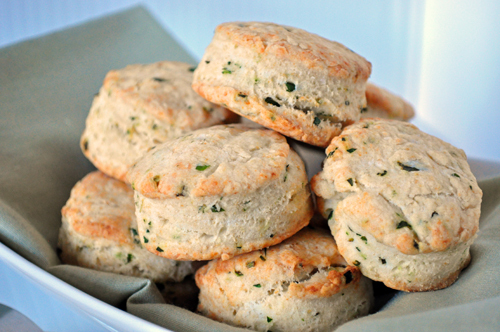 Your biscuits are the loveliest I’ve ever seen. Wow. Thank you for the process photos and recipe! What a great use for those fresh spring herbs. Those biscuits look simply perfect! Excuse me, but what is the last ingredient? “3/4 cup half and half” half and half of what..? Kate, half and half is a dairy that is half milk and half cream. Not sure if you live in the US or not so you may not have this available to you. You can substitute either milk or cream if you can’t get it. Valentina, half-and-half is a dairy product found in the US that is half heavy cream and half milk. If you can’t find that in your area you may make your own by using equal parts of each.